ALL RELIGIOUS TRADITIONS, no matter how carefully re-designed to suit modern tastes, nurture strange beliefs—strange, at least, to non-believers. What could be more bizarre, to those outside the faith, than theories of transubstantiation or reincarnation, and debates about the location of Limbo or the heritability of Original Sin? Yet a certain strangeness may be inevitable in such matters. Theologians ask ultimate questions. Out of a natural cosmos, they try to make supernatural sense. They are fashioning faith, and any faith worth the name strains credulity. “Credo quia absurdum est” was the motto attributed to the Christian apologist Tertullian. While most religions (including Tertullian’s) have distanced themselves from this absurdist paradox, the insight behind it survives to suggest that religious faith and common sense are profoundly different ways of knowing. For several centuries, Americans have been living under the regime of common sense—hard-headed empiricism, Yankee ingenuity, and so on—with respect to practical affairs. Yet at the same time this “nation with the soul of a church” (as G.K. Chesterton called it) has produced a plethora of emotionally charged creeds, most of them claiming exclusive access to the deity while denouncing their rivals and predecessors as cold, false, and dead. For cultural historians, the question arises: how have Americans brought their white-hot faith into harmony with the cool practicality of their everyday lives? How have they connected theology to ethics, precepts to practice? The classic answer to these questions was proposed, of course, by Max Weber in The Protestant Ethic and the Spirit of Capitalism. Weber did not equate the two terms of his title. He suggested instead that Protestant injunctions to disciplined achievement re-cast the Biblical doctrine of the calling, making all work God’s work and turning the world, in effect, into a monastery. The acquisition of wealth was an unintended consequence of actions aimed to magnify God’s glory. As the spiritual framework faded and accumulation became more acceptable, the Protestant Ethic became the Spirit of Capitalism—a set of moral and psychological sanctions for systematic moneymaking. Weber brilliantly charted the connections between precepts and practice, but succeeded less well in tracing ethics to belief. One might have expected the Calvinist doctrine of predestination to produce quietism, if not despair; but instead it underwrote an ethos of ceaseless striving. How did a theology that disdained good works create a world of good workers? Weber’s answer was that good works “are the technical means, not of purchasing salvation, but of getting rid of the fear of damnation.” Protestants fled from “salvation panic” into a frenetic busyness, which distracted them from anxiety even as it failed to discharge their sense of guilt. The psychological thinness of this argument suggests that at times even analysts as subtle as Weber missed the complexities of the relation between religious belief and social practice. In America, the playground of unfettered capitalism, Protestant self-help reinforced conventional success mythology; but Protestants also longed to create a Kingdom of God on Earth before Christ’s millennial return, and those longings helped to create a welfare state that would begin to tame capitalism, however inadequately, during the early decades of the twentieth century. Reformers railed against the “parasitical” manipulations of finance capital, sprinkling their speeches with Scripture and recalling the Puritan determination to elevate the interests of the public good over schemes for private gain. Despite its central role in legitimating economic development, the Protestant Ethic was also devoted to imagining alternative commonwealths and searching the nuances of the inner life. Neither of these tendencies could be smoothly assimilated to the capitalist version of rationality. For much of American history, the marriage of Protestantism and capitalism was only fitfully consummated. THE MARRIAGE of Mormonism and American capitalism, by contrast, has been less troubled by conflict. After an uncertain start, it has become stable and satisfying for both sides. There could scarcely be a better time than now to look into this relationship. This, we are constantly told, is “the Mormon moment.” The prospect of a Mormon (and capitalist) president is only a straw in a mighty wind sweeping across the land, according to the conventional wisdom offered by Stephen Mansfield in The Mormonizing of America. His list of Mormon success stories overlaps with many others. Apart from politics (Mitt Romney, Orrin Hatch, Harry Reid), Mormons have ascended to prominence in sports (Steve Young, the San Francisco 49ers quarterback), entertainment (the Osmonds, apparently the most recent example available, unless you include Glenn Beck), popular literature (Stephenie Meyer, the author of young adult vampire tales), and above all business (J.W. Marriott, the hospitality tycoon; Stephen Covey, the success guru and author of The Seven Habits of Highly Effective People; Clayton Christensen, management consultant at the Harvard Business School, a favored Mormon hangout, and the subject of a recent admiring profile in The New Yorker). The Mormons have even moved far enough into the mainstream to become the butts of Broadway burlesque. The assumption behind much of the “Mormon moment” chatter is that Mormons are especially suited for success in the brave new world of unregulated capital: tanned, rested, and ready. Their abstention from alcohol and caffeine keeps them healthy. Their self-discipline, stemming from missionary work and a strict code of personal morality, strengthens their capacity to compete in a global marketplace. Their attachment to family and community insulates them from the market’s worst abrasions. Their zeal for education in science and technology gets them first-class seats on the cyber-express. And their organizational genius makes them the ideal candidates to steer the lean, mean neo-liberal corporation through the storm-tossed business cycles ahead. The Mormon Ethic, which bears a strong resemblance to the Protestant Ethic in its Gilded Age prime, has become a powerful constellation of values for our second Gilded Age—perhaps a reassuring counterweight to the feeling that we are sailing into the globalizing future with no moral ballast whatever. Contemporary Mormons, whose ancestors were chased from town to town across the prairie by Protestant mobs, have become paragons of patriotism and icons of success. In 1856, the Republican Party platform declared Mormon polygamy one of “two relics of barbarism” in America (the other was slavery). In 2008, as in every other recent election, Mormons voted overwhelmingly Republican. What any of this has to do with the Mormons’ religious beliefs is a tricky question. Most journalistic observers are content to characterize the Mormon faith as “weird,” then toss off a few lines about sacred underwear and a quotation from Mark Twain describing The Book of Mormon as “chloroform in print.” Few ask what is Mormon about the Mormon Ethic. How does it differ from an updated version of Victorian Protestantism? Mansfield quotes a cable news pundit’s characteristically profound observation: “Mormons have goofy, mystical ideas that produce wonderful, earthly success.” How this production occurs is anybody’s guess. FORTUNATELY WE DO NOT have to leave things at that. Recent scholarship has provided us with a socially grounded history of Mormon ideas from the formative years of exile through the tortuous twentieth-century process of assimilation. What emerges from this literature is an epic in three acts. The first is the extraordinary story of Joseph Smith, the barely literate treasure digger in western New York whose revelations directed him to dictate (or as he preferred to say, to “translate”) The Book of Mormon—which despite its many soporific passages is an astonishing work of the religious imagination. Smith’s prophecies and pronouncements created almost the entire corpus of Mormon doctrine; his visions galvanized thousands of believers, who followed him from New York to Missouri to Ohio to Illinois, attracting hostile hordes at every turn, especially when rumors of Mormon polygamy began to spread. After Smith’s murder in 1844, Brigham Young takes center stage and holds it for the entire second act. Young was a crude Vermont carpenter who was nonetheless a magnetic public speaker, in glossolalia and in English, compelling enough to wrest power from rivals and command respect from the faithful. 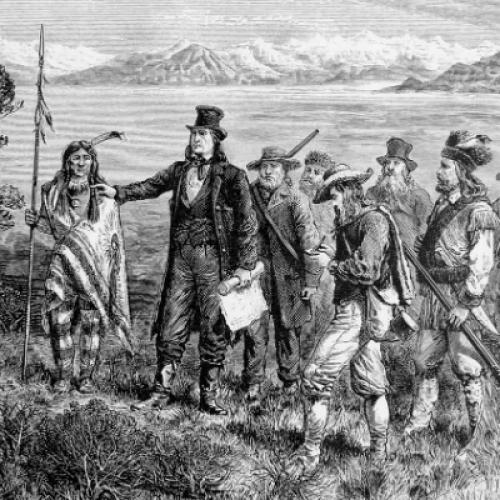 They followed him from Illinois to the Great Salt Lake, where he governed an embattled theocracy for thirty years, resisting legal and military assaults by “Gentiles” (non-Mormons), including the U.S. Army. And the third act of the saga begins after Young’s death in 1877, when the tale takes a less heroic turn toward the halting and complex process of Mormon assimilation to American society—a process led by pragmatists and organization men, only occasionally enlivened by gusts of zeal. Under relentless pressure from the federal government, the Utah Mormons abandoned polygamy in 1890, achieved statehood in 1896, and in subsequent decades became more royalist than the king, clinging to late Victorian values while the rest of American society slid away from them. In many ways the history of the Mormons follows the classic pattern described by Max Weber, Ernst Troeltsch, and other sociologists of Christianity: the routinization of charisma, the transformation of an ecstatic sect into an institutional church, and of the Mormon Ethic into the Spirit of Capitalism. But such an account neglects the persistence of Mormon beliefs, which mix familiarity with strangeness. The familiar parts evoke central themes in popular American evangelicalism—the faith in bodily resurrection and the reunification of families in heaven; the waning but still powerful sense of millennial expectancy, which encourages the stockpiling of goods for Armageddon; the conviction that America has a divinely ordained part to play in the sacred drama of world history, with Mormons themselves cast in the leading roles. Even Smith’s beliefs that Mormons were a covenanted people like the ancient Israelites, that America was the new Holy Land, that when Christ returned he would show up in Jackson County, Missouri—all of this was a more specific and literalist version of themes evoked by Puritans from John Winthrop to Jonathan Edwards. YET THE LITERALISM ultimately set Mormons apart, as it seeped beyond familiar narratives into ontological claims. Smith’s point of departure was a rejection of all Christian traditions, Protestant or Catholic. During his first vision, which occurred when he was fourteen years old, he asked the Personage who appeared to him what church he should join and (Smith later recalled) “I was answered that I must join none of them, for they were all wrong; and the Personage who addressed me said that all their creeds were an abomination in his sight; that those professors were all corrupt.” For Mormon believers, Mormonism is to Christianity as Christianity is to Judaism—a new dispensation that supersedes the old. The age of revelations is not over; God still speaks to humankind (at least occasionally) through the Mormon authorities. Evangelical critics who insist on distinguishing between Mormonism and Christianity are on firmer ground than the ecumenical secularists who want to assimilate everyone to the vibrant family of American pluralism. In fact there is a theological gulf between Mormonism and Christianity. The point of acknowledging it is not to distinguish heresy from orthodoxy, but to clarify the Mormon role in modern American culture—to explain how the Mormon Ethic came to integrate so smoothly with the twentieth-century Spirit of Capitalism, even more smoothly than the Protestant Ethic had done. To be sure, tensions between Mormon communalism and liberal individualism persisted throughout the nineteenth century, and down to the present the Mormon tradition continues to produce socialists, environmentalists, and pacifists as well as capitalists. But by now capitalists hold a commanding lead, and part of the explanation lies in Mormon theology. As in Protestant Christianity, the history of Mormon thought revolves around the effort to contain the molten core of ecstatic piety in a hard carapace of intellect. Most doctrines involve a dialectic of release and control. The idea of continuous revelation allowed the humblest Saint to imagine that God might still speak to him—this was the soul of Mormonism in the early decades. It opened the possibility that changes in the faith might come from anywhere, but even Joseph Smith knew that revelations could not be allowed to everyone. Eighty years after Smith’s time, the Mormon hierarchy announced that revelations would only be vouchsafed to the appropriate authorities. Spiritual experience was available only through channels. God is still speaking to us, but only to some of us. The containment of ecstatic experience through ecclesiastical authority is a familiar strategy in many religious traditions, but it plays a special role in Mormonism. Few if any religions celebrate the boundlessness of human potential with the zeal of Mormons. No wonder they need to counter that centrifugal force by demanding deference to centralized authority. The sense of boundlessness came from the collapse of distinctions between sacred and profane, God and man. “You have got to learn how to make yourselves Gods, ...” Joseph Smith announced, “and be kings and priests to God, the same as all Gods have done—by going from a small capacity to a great capacity, from a small degree to another, from grace to grace ... from exaltation to exaltation.” This implicitly henotheistic vision—a High God and many lesser ones—was dynamic, not static; it mandated “eternal progression” in this world and the next. And it promised Godhood to man. As Smith’s disciple Lorenzo Snow put it: “As man now is, God once was; as God is now, man may be.” The Mormon God is anything but an absolute, transcendent Other. He is flesh and blood as well as eternal spirit, and his creative powers are not what Christians might have thought. He did not make something from nothing. Matter pre-exists God: what is traditionally called creation was actually the organization of matter. THIS MORMON VERSION of materialism embodies an understandable recoil from theological abstraction, the Platonic heritage that has disembodied much Christian discourse for centuries. As Terryl Givens suggests in his probing book People of Paradox, the Mormon divinization of the material, even the banal, is akin to a sacramentalist outlook, but without the sense of transcendence and mystery that a remote God provides. Givens is a practicing Mormon with an uncommon sensitivity to the complexities and the vulnerabilities of his faith. He acknowledges the risk of hubris in the Promethean quest for Godhood, recalling the serpent’s promise in paradise (“ye shall be as gods”). This Promethean impulse is reinforced by a Mormon tendency to use a language of empirical certainty, even for propositions that may seem anything but empirical—a tendency traceable back to Joseph Smith. As a result of his visionary experience, he said, “I have learned for myself that Presbyterianism is not true.” The search for empirical (or pseudo-empirical) certainty, bounded by priestly authority, is one engine of eternal progression. Salvation is a process, not a goal; its core is action, not introspection. Much of this theology resonates with commonsense American sensibilities—the priority of matter, the organizer God, the celebration of doing over being, the faith in progress, the prospect of perpetual personal growth. No wonder Harold Bloom, in search of The American Religion, found Smith’s vision irresistible. “What Whitman sang, Joseph Smith actually embodied,” Bloom wrote. “To be Adam early in the morning, confronting a God who had not created him, and who needed him to become a god himself.” It is alarming how easily this exalted humanist vision turns into psychobabble. Consider the cautionary example of Jane Barnes, who was a writer on the PBS documentary The Mormons. Falling in Love with Joseph Smith is a breathless and weepy confessional account of her encounter with the faith, which apparently helped her to understand (if only retrospectively) a series of crises in her life. We learn far more than we want to know about Barnes’s flight from conventional family life into a long-term lesbian affair and her late-life relationship with an old boyfriend, now dying by inches of Parkinson’s disease. You may wonder what all of this has to do with Joseph Smith, but in fact he is just the sort of “religious visionary with no regard for the rules” who can speak to us amid the “particle accelerator” of contemporary life. Joseph, in fact, was not “a man of his time”: he was a “naïve modernist.” Or postmodernist: he was “edgy” and given to irony. The Book of Mormon is a self-conscious meditation on texts, pervaded by “campiness.” His life was like a rock star’s in its “round-the-clock experiencing of contrasting realities.” But for Barnes, Smith’s big appeal is his “sexual energy,” which overflows into polygamy. Her book is an extended exercise in a-historical (or anti-historical) projection. Beneath the silliness, however, Barnes’s book reveals an important truth about Mormonism’s origins amid the cultural ferment of the young republic. The yearning to enact an endless process of re-inventing the self, on an open prairie of boundless possibility: these grandiose sentiments animated penniless treasure diggers as well as New England intellectuals and Brooklyn poets. In his way Smith was a kindred spirit, as well as a contemporary, of Emerson and Whitman. Their celebration of the self and its potential survives in the success mythology of our own time, diminished by market discipline. Mormons, like other Americans, have had to orchestrate the tensions between private longings and public necessities. IN THE BEGINNING was Joseph Smith. According to Matthew Bowman’s able synthesis in The Mormon People, Smith’s spiritual career had “a particularly American flavor—a confident amateurism, an affinity for re-creation, renewal, and resurrection, excitement at the possibilities that religious liberty, nearly unlimited land, and economic prosperity might bring.” His millennial vision demanded “a nation, a new Israel, a people bound as much by heritage and identity as by belief.” And that was what his efforts eventually created. Smith grew up in a society thronging with counterfeiters and confidence men, not to mention the confidence men of the Lord—the itinerant revivalists who swarmed across the rural districts, stirring hearts and saving souls. Coming of age amid this ferment in western New York during the 1810s, young Joseph was “somewhat partial to the Methodist sect” but was quickly disappointed when he discovered that he could “feel nothing” even surrounded by tears, trances, and convulsions. This was the evangelical nightmare: the discovery that your religious feelings are not aroused like those of everyone else around you. Yearning for intense emotion as proof of authentic conversion, Joseph read the First Epistle of James and found this passage: “If any of you lack wisdom, let him ask of God.” Joseph entered a secluded grove and asked of God: what church should I join? According to his later account, two Personages appeared in a pillar of light, and one responded: none. Three years later an angel who called himself Moroni (the name has always had unfortunate associations for skeptical non-Mormons) appeared by his bedside, announcing that God had work for him to do. He told the boy of a book deposited under a stone in a hill nearby, written on gold plates, recounting the full story of the former inhabitants of the North American continent. The fullness of the everlasting Gospel, Moroni said, was contained in it. Joseph claimed that he found the stone, pried it up, and discovered a crude box containing gold plates and two “seer stones” set in a silver bow attached to a breastplate—much like the Urim and Thummim used in ancient Hebrew divination. He reached for the plates and was hurled backward. He must wait four years, said Moroni, to show that he was a sincere seeker, and not just another gold-digger. The neighborhood was full of them. Smith reputedly had a knack for finding buried treasure, and was hired by a local farmer to dig for silver on his property. Finding none, the young man did find the comely Emma Hale in the village nearby. Emma resisted her parents’ opposition and became Joseph’s wife. She was committed to his vision, but she was in for a bumpy ride. Four years after his first discovery Smith returned to the hill and retrieved the box. In The Book of Mormon: A Biography, Paul Gutjahr deftly untangles Joseph’s efforts to keep the plates hidden while he translated what he called the “reformed Egyptian” characters that covered them. Hunched down under his hat, peering at the plates through the seer stones, he read aloud what he saw—at first laboriously, then in a rush of inspiration. The process took several months and required absolute secrecy. Only a few trusted associates could be involved. Emma was one; Martin Harris, a prosperous local farmer, was another. Harris’s financial backing would prove crucial. When the translation was finished, he mortgaged his farm to print five thousand copies of The Book of Mormon. According to Joseph, the angel Moroni then reappeared to him and asked to have the plates back. He of course complied. THE BOOK OF MORMON defies summary, but its outlines can be traced. The action begins in about 600 B.C.E. A group of Israelites flees Jerusalem as the Babylonian armies approach. They arrive in the Promised Land, which turns out to be the North American continent. The founding family contains two rival sons, Nephi and Laman, who found bitterly opposed civilizations, the righteous Nephites and the wicked Lamanites. The first narrator is Nephi, and when he dies Mormon takes over. Mormon is a Nephite soldier, writing as an old man in about 300 C.E., when the Nephites have been corrupted by prosperity. Mormon turns the project over to his son Moroni, who adds a few afterthoughts and buries the plates in the Hill Cumorah, where he directs Joseph Smith to find them centuries later. As Bowman observes, The Book of Mormon is structured like a jeremiad: the rise and fall of the Nephites parallels the cycle of prosperity and corruption in Israelite civilization, as described in the Hebrew Bible. By the 1820s, the jeremiad had long been a pervasive rhetorical form among American Puritans and their republican descendants. Nor was that the only connection between this supposedly timeless text and its early American context. There were references to debates over infant baptism, church government, and revivalism, allusions to fears of secret societies, and other evidence that marked the book as a product of its historical moment. The Book of Mormon itself was close to the Protestant Bible. For the Mormons, it was not a source of doctrine but a proof of Smith’s divine inspiration. After The Book of Mormon, Smith continued to receive (or to imagine) new revelations on matters great and small. The most theologically important were revelations concerning the baptism of the dead, who could be posthumously saved by being brought into the Mormon fold, and the King Follette sermon, which multiplied gods and urged humans to aspire to Godhood. Besides revelations, these books also contained more “translations”— expansions and elaborations of scriptural narrative. The most important of these was the Book of Abraham, which Smith claimed to have translated from Egyptian papyri that he had bought in 1835 from a traveling showman who exhibited mummies for profit. The Book of Abraham fostered notions of pre-mortal life, recalling Wordsworth’s child “trailing clouds of glory” from heaven, but without the romantic sense of loss; it also contained a prohibition against black people entering the Mormon priesthood. The power of the priesthood became a central feature of Mormonism. What Smith called “the priesthood of Aaron” had the power to baptize converts and to ordain other priests. But another priestly tier was needed to contain the energies of ecstatic experience. Midway through a church conference in 1831, when Mormons began speaking in tongues, Smith intervened and re-imposed order by invoking the authority of a higher priesthood, the Melchizedek priesthood, who would be the most likely recipients of divine revelation. The two priesthoods were organized into “quorums” by office. All were appointed, not elected. The most powerful became the Quorum of the Twelve Apostles, which Smith was inspired to organize in 1835. The president and two assistants made up the First Presidency. These would become the crucial offices in the decades to come. Hierarchy was creeping into the faith, as a way of cementing community with authority. THE MORMON community expanded quickly, mixing visions of heavenly and earthly glory. Smith and Sidney Rigdon, a converted Baptist, shared a revelation of nearly universal salvation. Everyone would be saved (except for a few “sons of perdition,” who denied Christ to his face), but there would be degrees of glory, from the telestial (ordinary wicked folks, including “liars and sorcerers and adulterers”), the terrestrial (“honorable men of the earth” who were not devout Christians) and the celestial (baptized members of “the church of the Firstborn”). Despite the ambiguity of that last phrase, the emphasis was on the importance of heavenly community and the ease of entering it. But what really pulled the Mormons together was the dream of building Zion on Earth. In 1831, Smith and his followers joined Rigdon in Kirtland, Ohio and took to calling themselves “The Church of the Latter-day Saints” to emphasize their millennial expectations. But Kirtland was not Zion. When Smith visited Missouri in 1831, he discovered what he believed would be Zion’s actual location, in the blossoming prairies outside Independence. This, he declared, was where the Garden of Eden had been, and where Adam would return in the Last Days to visit his people. Jesus would not be far behind. Smith was transforming the American continent into the Holy Land. Still, money presented a problem. Smith had always managed it ineptly. As part of his early preparation for financing the New Jerusalem, he announced the doctrine of “consecration,” which involved turning your property over to the church, which would then return to you enough to provide for your family, and keep the rest. The idea never really caught on, especially among the more prosperous Mormons, and Smith eventually replaced consecration with tithing (donating ten percent of gross income to the church). When times grew tight in Kirtland, Smith attempted to charter a bank (the accepted way of manufacturing money in antebellum America); and when the legislature refused, he resorted to crude subterfuge, stamping the prefix “anti” before the word “banking” on his Kirtland Safety Society notes and opening an “anti-bank” (which he assumed was technically legal) with $100,000 worth of pseudo-currency. The man accused of counterfeiting a religion had been reduced to counterfeiting money. The scheme lasted three weeks, until the notes crashed and the “anti-bank” ran out of capital. Religious capital was another matter. Smith was accumulating it rapidly, in Ohio but also in Missouri, where the spread of Mormon settlements was provoking violence among the Gentiles. Governor Lilburn Boggs of Missouri declared that Mormons must be driven from the state or, if necessary, exterminated, so as to protect the public peace. Vigilantes attacked a Mormon settlement at Haun’s Mill, leaving seventeen dead, including women and children. Terrified Mormon refugees fled east to Illinois, where they soon settled in Commerce, on the Mississippi. Joseph renamed it Nauvoo, a crude transliteration of a Hebrew word meaning “beautiful.” It was not Zion, but it was the site of many theological innovations, including the Emersonian notion that man, could he but realize it, might move through mortality into divinity. The Nauvoo temple became the site where Smith’s revelations were implemented as ordinances. Baptism of the dead was already underway, but in 1842 Smith inaugurated the Endowment, which involved the washing and anointing of the priesthood, the donning of white undergarments and robes, and the reaffirming of the Mormon priests’ lineage to the priests of the Hebrew Bible. The temple was also the place where family relationships would be sealed for all eternity—another source of stability amid the chaos and the violence surrounding the embattled sect. The revelation that marriages could be sealed for eternity, alongside Smith’s fascination with Old Testament patriarchy, became the basis for polygamy. In 1843, Smith made the revelation known to a select inner circle. Plural marriages, as Bowman writes, were “not ... private communions but rather links in a great network of relationships.” Many involved men taking responsibility for dependent widows or other women who might otherwise be destitute. Some remained unconsummated. But it would be ludicrous to pretend that polygamy lacked a sexual charge. Smith managed to “seal” himself to several women in secret. But Emma knew, and she was not pleased. She stoically endured the new regime, but always publicly denied that her husband had ever taken another wife. He eventually married thirty. But when he proposed plural marriage to Jane Law, she fled in revulsion to her husband William, a member of Smith’s First Presidency. William bitterly contested the doctrine, but Smith stood by it, and the Laws were excommunicated. Concluding sadly that Smith was a false prophet, William Law began to attract a band of dissenters, with their own newspaper. The Nauvoo Expositor denounced polygamy as corruption and demanded a return to original Mormonism. Urged by Smith, the Nauvoo City Council declared the paper guilty of libel. City marshals destroyed the press, the plates, and any remaining copies. An ad hoc militia formed quickly, intent on fighting back against the Mormons. Smith was charged with “rioting” and was murdered in jail two days after he had surrendered himself to the authorities. The prophet had become a martyr. JUST WEEKS AFTER Smith’s death, ten thousand Mormons gathered in Nauvoo to decide which of two men should succeed Joseph Smith as leader of the Mormon church. Rigdon, a member of the First Presidency, gave a long and meandering speech. He was followed by Brigham Young, then president of the Twelve. Young simply affirmed that the Twelve were the rightful collective heirs of Joseph Smith’s authority and that he was the head of the Twelve. But he was a spellbinding orator. Those present later said that when Brigham Young spoke they heard the voice of Joseph Smith speaking through him. Surely he was the man to lead the Mormons forward, into a new Promised Land. John Turner shows how he did it, in his strong and authoritative biography. Young was born in 1801 in rural Vermont, to a hardscrabble farm family. In 1813 they moved west to Genoa, New York. The Youngs were a Methodist family, which in that time and place meant a strict moral code punctuated by bouts of revivalist ecstasy. Young was unmoved. “Men were rolling and bawling and thumping,” he later recalled, “but it had no effect on me.” Yet he followed his siblings in joining the Reformed Methodists at twenty-three, insisting on baptism by total immersion. Young married Miriam Works in 1824 and moved to Mendon, near Rochester, where he built a house on his father’s land and took up carpentry. In 1827, when they heard stories of Joseph Smith and the golden plates, he, his parents, and his siblings were all receptive listeners. Later Young and his friend Heber Kimball claimed to have seen a vision of a battle in heaven—muskets cracking, swords clashing—on the very night the plates were found. In January 1832, Young traveled to Columbia, Pennsylvania, to meet up with Mormons gathered there. They spoke in tongues, and Young felt the exaltation that up to then had eluded him. Back in Mendon, where several Baptist families had already embraced Mormonism, Young and his family all converted. It was an experience of authority as well as ecstasy: “I was ordained to the office of an Elder before my clothes were dry upon me,” Young recalled. Soon after his baptism, Young was with several other elders when one began speaking in tongues and Young “caught the contagious fire,” as Turner writes. Even in a visionary era, glossolalia was a fringe phenomenon. But it was central to early Mormonism. After Young’s wife died in September he headed for Kirtland, where Smith had just relocated. The night they arrived, the newcomers spoke in tongues. Smith called what he had heard “the pure Adamic language,” affirming that it came from God. Young felt embraced and honored. He rose quickly in the church, through perseverance and loyalty but also owing to displays of spiritual power—delivering animated addresses to the priesthood, singing songs of Zion in a foreign tongue. In 1834 he married Mary Ann Angell, who had been drawn to his magnetic preaching. Four years later Young left for England, where he played a major role in tripling the Church membership (to six thousand) during the year he was there. Not long after Young returned from abroad, in early 1842, Smith commanded him to “go & get another wife.” Young hesitated, but soon got the hang of it. He eventually acquired fifty-three plural wives, from ages sixteen to sixty-six, who produced fifty-eight children. Mary Ann, who had thought that she was signing on to a monogamous marriage, responded to polygamy with “displeasure and stoic acceptance,” Turner observes. She began to attend Young’s subsequent sealings, and allowed herself to be sealed to him for eternity. Widows and other dependent women were sealed for time, not eternity—except to their deceased husbands. After Smith’s death and Young’s oratorical triumph over Rigdon, Young formalized the church presidency, which consisted of a president and two counselors—Heber Kimball and Young’s cousin Willard Richards. Rigdon charged that they were counterfeit prophets, and was promptly excommunicated. The Nauvoo Mormons remained under siege. Accusations spread that the town sheltered adulterers and thieves, and manufactured counterfeit coins—what the locals called “Nauvoo Bogus.” Anti-Mormon mobs burned outlying settlements. Mormon leaders prepared to head west. In the months they remained in Nauvoo, Young used the new temple to consolidate a synthesis of heavenly and earthly authority: “everyone in their [sic] order, before God and each other—this is the secret of the whole thing,” he said. With this vision in mind, he opened the Endowment ceremony to the whole community. Thousands of Mormons pressed forward into the temple, sworn to secrecy about the rites they were to receive. This was a key moment in Young’s consolidation of power. But not everyone was impressed. On the verge of the Mormon move west in 1846, Emma Smith stayed behind. “The Twelve have made bogus of it,” she said. PORING OVER MAPS, the Mormon leadership pondered possibilities until Young proclaimed that the Great Basin would be the Saints’ refuge. Young would lead the advance guard, the Camp of Israel, in a race for Zion. Crossing the Mississippi in February 1846, the Camp slogged across Iowa. Progress was excruciatingly slow, and the emigrants were forced to stop in eastern Nebraska, where they established Winter Quarters. In Winter Quarters, far from prying Protestant eyes, the Mormons practiced polygamy more openly. Young began gathering his wives together, urging those who had stayed behind to join him for the trek west. Some did. They experienced the benefits of sisterhood, which was some consolation for the trials of polygamy—the basis of which, Young made clear, was absolute patriarchy. The husband, he said, is “the head & God of the woman.” Rejecting Victorian notions of female purity, he declared a woman to be “the [dirtiest] creature .... dirtier than a man.” Nor did women have any authority in the domestic sphere, as Victorian ideology decreed. Only Young or his representatives could authorize marriages. It was men over women, and Young over all. When the emigrants arrived in the Promised Land in July 1847, Young made it official: “this is the place,” he said. Of course the cursed descendants of the Lamanites, the Ute and Paiute Indians, were already there. But Young was sure they would provide little obstacle to his vision—a theocratic and largely autonomous kingdom. Not all the Apostles were at ease with his autocratic rule, but Young insisted that he was the only “oracle” of revelation. He managed to get himself unanimously re-elected First President by the Twelve at a meeting when his opponents were absent. Again he chose Kimball and Richards as counselors. When the election results were announced, the gathered Mormons shouted hosanna, and violins played “God Save the King.” Young’s theocratic sovereignty was confirmed. Back on Earth there were conflicts with the local Indians. Young was not averse to military action, but more commonly he resorted to the maxim that it was cheaper to feed them than to fight them. As for making theological sense of African Americans, Mormons depended on the curses of Cain and Ham (which did not specify dark skin as the consequence of God’s wrath, but were widely interpreted to do so). The Book of Mormon makes the “seed of Cain” black, and the Book of Abraham excluded descendants of Ham from the priesthood. Though Smith had embraced a few black priests in the early days, the drift from racial egalitarianism to racial exclusion was characteristic of most American denominations at the time. WITHIN A FEW YEARS after the great migration, Young’s fear of cooling ardor helped to launch the “Mormon reformation.” The need for re-dedicated fervor was intensified by a series of natural scourges: drought, crickets, and grasshoppers created a constant emergency atmosphere. The Reformation included a home missionary program to monitor morals and “lop off ... rotten branches” from the tree of faith. Young himself, concerned about lukewarm commitments to plural marriage, prodded more people into it. During this same period, Young preached the doctrine of blood atonement: some sins, he announced, can be paid for only by the blood of the sinner, offered by the sinner himself or taken by another. Possible candidates included adulterers, murderers, and blasphemers against the Holy Spirit. The doctrine of blood atonement led to at least one castration (of a local bully) and to the assassination of several apostates. Young later mused that as a result of the doctrine there had been “quite a number killed, and, I believe, many more ought to have been.” As Turner concludes, “Young, who had feared for his life while on the margins of Illinois society, created a climate in which men and women on the margins of Mormon society lived in a similar state of fear.” Extra-legal justice accompanied the effort to revive spiritual intensity. In early 1857, Mormon leaders presented a memorial to the incoming President James Buchanan, warning that if the federal government continued to send “office seekers and corrupt demagogues” to Utah, the citizens would drive them away. Buchanan dispatched federal troops to the territory. Anticipating Armageddon, Young encouraged the Paiutes and other Indians to attack Gentile wagon trains and to prepare to fight the U.S. Army. The Mormons themselves would also prepare for a fight. They quickly found one when they encountered a wagon train en route from Arkansas at Mountain Meadows in southern Utah. The Mormons, Turner writes, “shot, stabbed, and slashed the throats of emigrants who pled for their lives,” including women and children. Young sent a message to try to stop the killing, but it arrived too late. He had sanctioned the climate of righteous anger, combined with fear and millennial expectation, that had led to mass murder. And the men who did it remained in Young’s favor. No wonder that many observers, Mormon and Gentile, began to think that Young had condoned the slaughter. Meanwhile the U.S. Army was advancing. Finally the troops stopped sixty miles north of Salt Lake for the winter. Spring brought relief and resolution. Buchanan promised a continued military campaign against Mormon resistance, but offered to pardon all who would submit themselves to the authority of the federal government. There would be no trials for treason, but also no guarantees of what federal judges would do in future. Young accepted the inevitable, concealing his failure with bluster. The army marched through Salt Lake City and built Camp Floyd forty miles away. It was the beginning of the end of theocratic government in Utah. YET YOUNG continued to circle the wagons. He rededicated the Mormons to collective enterprise and economic self-sufficiency, urging the cultivation of tobacco and cotton and other cash crops. But the Saints remained economically dependent on the army that they despised. Mormon merchants needed customers with money. Meanwhile Congress was on the march. In 1862, the Morrill Anti-Bigamy Act declared polygamy unlawful and limited church holdings to $50,000. Within a few years, the coming of the transcontinental railroad ended the isolation of Zion. By that time the Saints were experiencing their own internal tensions. It was the old story told in the jeremiad: grasping merchants, even Mormon merchants, overlooking their obligation to the community. “They will get sorrow,” Young predicted, “most of them will be damned.” (He foretold damnation often, for a self-proclaimed believer in “the contraction of hell.”) He tried local railroad start-ups, Mormon-owned, to co-opt the impact of the transcontinentals. He also started Zions Cooperative Mercantile Institution in 1868, one of the rare successful Mormon efforts at co-operative merchandising. In 1874, Young launched the United Order movement, his final attempt to revive communalism. Resources were pooled through the revived principle of consecration, but private property was not abolished. Individuals received cash returns based on their contributions and labor. The only settlement that abolished private property was Orderville, a community of poor folks in southern Utah that achieved, according to the novelist Wallace Stegner, a rare “communism of goods.” But most Mormons were no more willing to commit to consecration in the 1870s than they had been decades earlier. Nor was Young himself willing to consecrate his own substantial holdings, which included a textile factory in Provo and more than ten thousand acres of farmland. Suffering from arthritis, digestive disorders, and urological problems, Young in decline still epitomized the melding of body and soul at the core of nineteenth-century Mormonism. Months before his death, he lubricated his catheter with consecrated oil, and recommended the practice to others. For Young, the sacred and the profane were forever joined. SINCE YOUNG’S DEATH in 1877, the story of the Mormons in America has in many ways recalled the pattern familiar to historians of other American religions. The lowering of the emotional temperature, the reining in of ranters, the growing preoccupation with efficient organization—all these developments led toward greater absorption in that vast bland civil religion known as the American Way of Life. Still, there were major obstacles to assimilation. One was Mormon hierarchy, which to many Protestants was all too reminiscent of Roman Catholicism. But what really stuck in the Christian craw was polygamy. In 1882, Congress strengthened the Morrill Act by passing the Edmunds Act, which made “unlawful cohabitation” a crime and denied polygamists the right to hold office, vote, or serve on a jury. Soon after it passed, federal marshals poured into Utah in pursuit of polygamists. Mormon leaders fled Salt Lake City and went into hiding in various settlements throughout the state. The marshals tracked them down. More than a thousand men were arrested, convicted, and fined or imprisoned. Then, in the Edmunds-Tucker Act of 1887, the federal government took dead aim at the Mormon church itself, abolishing its incorporation and expropriating all its property except chapels and cemeteries. That same year John Taylor, Young’s successor as president of the church, died in hiding in a hamlet north of Salt Lake City. Wilford Woodruff, who succeeded Taylor, saw the hopelessness of the situation. In 1890, he persuaded the Quorum of the Twelve to approve what became known as the Manifesto. It was neither a new revelation nor a renunciation of the doctrine of polygamy. It was merely a statement that the Mormon president intended to abide by the federal laws and would urge his fellow church members to do likewise. The end of sanctioned polygamy marked a decisive moment in Mormon history. The dream of Zion was dead, at least in the form that Smith and Young had envisioned it. Now it was time for the organization men to take charge of the church, and it could not have been a more propitious moment. Utah became a state in 1896, the year that William McKinley’s election ushered in the reign of corporate capitalism in America. For the next six years, an unprecedented wave of mergers created the behemoths that would dominate the American economy throughout much of the twentieth century. Mormons, having shed their lascivious reputation, were poised to thrive in the new era, as the self-help ethic was re-shaped to suit the new corporate ethos of managerial expertise and “team play.” In the 1850s, Brigham Young was routinely depicted in the press as a tyrant surrounded by a slavish harem; but by 1930 the Mormon President Heber Grant showed up on the cover of Time, extolled for his business acumen and his church’s prudential morality. The Mormons, it appeared, had at last achieved respectability. Part of this transformation involved theological change. The key move was the re-definition of celestial marriage, a phrase that Smith had used as synonym for polygamy. In 1899, the British convert James Talmage’s Articles of Faith provided theological justification for the view that celestial marriage was celestial not because it was plural but because it was eternal. Several decades later Grant made Talmage’s view official doctrine, stating that “celestial marriage ... and polygamous marriage are not synonymous terms.” Instead “monogamous marriages celebrated in our temples are celestial marriages.” Armed with this doctrine, Mormons became as passionate in their defense of monogamy as they had once been of polygamy. The renewed emphasis on baptism of the dead, coupled with the disavowal of polygamy, re-figured the Mormon idea of community. “The bonds that polygamy had created across space would now reach with renewed vigor across time,” Bowman writes. Talmage and two other theologians, John Widtsoe and B.H. Roberts, began a progressive reconstruction of Mormon thought that aligned it with dominant trends in liberal Protestantism, even while they preserved continuity with Smith’s revelations. Their synthesis, Bowman says, “remains the Mormonism believed by most Latter-day Saints today.” Religion and science were one. God was subject to the laws of the universe and owed his divinity to his capacity to understand and to manipulate them. He was not a creator who made something from nothing; he was “a great craftsman, organizing previously inchoate matter.” Nothing he did was mysterious; everything was subject to rational investigation. While the theologians brought God down to Earth, they also raised man up to heaven. Humans shared God’s uncreated, eternal nature and they would one day share his glory through a process of “eternal progression”—“the refinement of the soul’s capacity to participate in divinity through the exercise of Christ-like virtues.” As they did for most Christians, “Christ-like virtues” came to resemble the dominant values of the moment. For Mormons as for their fellow Americans in the early twentieth century, this meant that the key to salvation became the cultivation of a disciplined character, committed to mastering the world through knowledge. THIS THEOLOGY was ideally suited to the managerial ethos of early twentieth-century America. It was the moment when efficiency and uplift were twinned. Perhaps their most successful union surfaced in the Prohibition movement, which succeeded by 1919 in banning alcohol consumption from sea to shining sea. Managers hailed the prospect of a sober, punctual work force; moralists hailed the triumph of social discipline over sodden chaos. Mormons knew an opportunity to seize legitimacy when they saw one. In 1921, Heber Grant announced that adherence to Joseph Smith’s Word of Wisdom (abstention from alcohol and caffeine) would be required of any Mormon seeking a “temple recommend”—the permission to participate in temple rituals. Up until that time, the Word of Wisdom had been interpreted as non-binding health advice. Grant, like a good managerial progressive, made it a prerequisite for full membership in the church. Ever since, the Mormons’ abstemious habits have reinforced their ethic of disciplined achievement. As Mormons rose in respectability, their church became less tolerant of ecstatic revelations. Speaking in tongues was an especially embarrassing hangover from the primitive church. During the 1920s, the First Presidency announced that the gifts of miraculous healing and divine revelation were restricted to the ordained priesthood. Democratic spontaneity was yielding to bureaucratic regulation. By the mid–twentieth century, an increasingly ambitious missionary program created new organizational challenges. In 1960, the Apostle Harold Lee was put in charge of the Correlation Committee. His model was the American corporation, then at the height of its Fordist moment, and his watchwords were simplification and standardization. The correlation movement strengthened the institutional church, eliminated the remnants of charismatic spirituality, and reinforced the emphasis on correct behavior over theological innovation. During and after the 1970s, countercultural ferment provoked conservative retrenchment—though the maverick President Spencer Kimball did come up with a theological breakthrough. In 1978, after two years of fasting and prayer, he announced with relief and joy that he had received a revelation: black men could now be ordained into the priesthood. Mormons had been uncomfortable with their church’s position for decades, but the leadership had dug in its heels: a fundamental departure from scripture could only be justified by a revelation from God. Kimball had the courage to imagine (or experience) one. But despite Spencer Kimball, the Udall family, and a handful of others, most Mormons joined in the Republican Kulturkampf that dominated the last third of the twentieth century—spearheaded by an awkward alliance of religious and economic fundamentalists. Indeed, the alliance was probably less awkward for Mormons than for Christians. Mormons embraced economic individualism and hierarchical communalism; they distrusted government interventions in business life but not in moral life; they used their personal morality to underwrite their monetary success. They celebrated endless progress through Promethean striving. They paid little attention to introspection and much to correct behavior. And their fundamental scripture confirmed that America was God’s New Israel and the Mormons His Chosen People. It would be hard to find an outlook more suited to the political culture of the post–Reagan Republican Party. Recent poll results confirm the merger of Mormonism and Republicanism. As Lee Trepanier and Lynita Newswander report in LDS in the USA, 65 percent of Mormons identify with or lean toward the Republican Party—15 percent higher than Evangelical Christians and 30 percent higher than the general population. Moreover, they write, “56 percent of Mormons prefer smaller government (compared with 43 percent of the general population), 49 percent of Mormons believe the government should do more for the needy (compared with 62 percent of the general population), and 54 percent of Mormons think the government should do more to protect morality (compared with 40 percent of the general population).” These figures confirm Mormon ties to the Republican Party, but they also reflect a worldview that may not travel overseas too well. The Mormon Moment is characterized by a vigorous missionary movement and a flurry of temple-building in foreign lands, but as Bowman reports, retention rates are low—hovering around 25 percent in Latin America, for example. Part of this stems from the resolute Americanism of the Mormons, their unwillingness to adjust to local customs or tastes. It may be that their faith is peculiarly American in more ways than one. Yet it would be a mistake to underestimate the Mormons’ appeal, especially if they encourage the curious to explore the implications of Mormon beliefs. Terryl Givens has done that with extraordinary care in People of Paradox. The paradoxes in question involve the co-existence of apparent opposites: individualism and authoritarianism, epistemological certainty and endless questing, the exaltation of the mundane and the humbling of the sacred. In every case, the paradox seems to satisfy believers’ contradictory longings—to choose freely and to fit in, to be confident in one’s knowledge but hungry for more, to find the exalted in the familiar and the familiar in the exalted. Older religions might well envy the capaciousness of the Mormon appeal. BUT THERE IS a price to be paid, as Givens acknowledges with exceptional candor. He observes that “the moment of conversion for Mormons is not generally seen as the recognition of one’s sinful nature and transformation to a state of grace, but the moment of one’s coming into possession of the truths that pertain to external realities.... There seems in Mormonism an emphasis on certainty, rather than faith.” This sure knowledge is accompanied by an imperative to acquire more, but it is all external; there is no inner life at all. “Joseph’s crowned Saints are ... Faustian strivers endlessly seeking to shape themselves into progressively better beings, fashioning worlds and creating endless posterity, eternally working to impose order and form on an infinitely malleable cosmos,” Givens writes. This “dauntingly eternal process of self-transformation” recalls the inner struggle of religious doubters in other traditions—except that there is no inner struggle, no introspection. Small wonder that Mormons measure commitment to their church with labels such as “active” and “inactive” rather than “devout” or lapsed.” To be sure, certainty is a big payoff. But this is a religion with few opportunities for contemplation, few sanctions for stillness. The question leads us back to Weber, who viewed the transformation of the Protestant Ethic into the Spirit of Capitalism as part of the larger disenchantment of the world—the great loss of wonder. Modern capitalism, he argued, required that the world be perceived as inert matter, manipulable into commodities by technicians. A God who makes the world by organizing matter does indeed seem the ideal deity for this economic system. The Mormon Ethic merges easily with the Spirit of Capitalism. OR AT LEAST with a Spirit of Capitalism. What Weber’s argument left out was the huge irrational dimension of economic life under capitalism—the fantasies and fears, the dreams of overnight wealth and magical self-transformation, that pervade the popular imagination even as rational managers seek to maximize productivity and workers slog diligently. Magic and money are twinned, in our time as they were in the time of the treasure digger Joseph Smith. As the form of money grows more evanescent, evaporating from gold coins into numbers on a screen, its mysterious powers multiply—its power to compel fascination and reverence, to replicate itself indefinitely or disappear without a trace. Money remains enchanting. The magicians of money, the investment bankers and hedge fund managers who claim to have harnessed it to their ends, are as spellbound by its aura as the people who sweep their offices. (Maybe more so.) Indeed, it is possible to see the entire structure of capitalist rationality—the acres of statistics, the mountains of research—as a vast effort to contain the chaotic irrationality at the heart of the money economy. That effort has been more successful at some historical moments than at others. Perhaps the high point of the containment project was the Fordist moment of the mid-twentieth century—the era of generalized prosperity through mass production, of lumbering corporate hierarchies and organization men. This was the closest American society has come to the full realization of the Weberian Spirit of Capitalism. The Mormons fit into this epoch nicely, though sometimes eccentrically. I once knew a woman who grew up in that era, whose father had converted from Catholicism to Mormonism: he packed the whole family off to the Utah desert and set them to work making bricks, as he had seen the ancient Israelites do in The Ten Commandments. True to their theology, the Mormons have always been about making things, from clay or stone or steel. This attachment to the material—along with financial discipline—was how they contained their own fascination for the mysterious power of money. They avoided speculation, disdained debt, paid in cash. That was what it meant to aspire to Godhood. One of the most remarkable aspirants during the Fordist moment was George Romney, the Mormon head of American Motors, who organized matter with extraordinary success: he manufactured a compact car, a good one. He served three terms as governor of Michigan and ran for president. It would be hard to imagine a better embodiment of the Mormon Ethic—disciplined achiever, loyal family man, conscientious public servant. BUT WHAT HAPPENED when money became detached from materiality, as it did (once again) during the last third of the twentieth century? Could Mormons become detached, too? It is tempting to see the Mormon presence at the Harvard Business School as a symptom of disengagement from material production, since business schools are temples of immaterial capital—sites of enchantment for Mormons and Gentiles alike. They are one of the places where young managers learn to press apparently rational methods into the service of money mania. As Clayton Christensen’s work demonstrates, it doesn’t matter what you make as long as you can sell it. The product is nothing, the method is everything. But a stronger sign of Mormon detachment from making things is the career of George Romney’s son Mitt, who has outdistanced his father politically and (one suspects) financially. A faithful Mormon like his father, Mitt came of age at a post-Fordist moment—the go-go 1980s, when manufacturing had lost its allure and the magic of speculative capitalism was reasserting itself. As deregulation encouraged the formation of private equity firms, Mitt and his partners at Bain Capital occupied the cutting edge of financial innovation. They helped to pioneer the deployment of leveraged buyouts, manipulating other companies’ debts (which Bain itself had created) to make quick profits for themselves. They manufactured nothing, except money. A photograph taken at the time of the company’s founding shows Mitt and his partners posing with their product. Some of them, including Romney, are displaying banknotes; others are stuffing them into their mouths. This is not a picture of disciplined achievement or the productive organization of matter. It is a picture of men in the grip of a money-fetish. Romney presents himself as the quintessential CEO, the turnaround guy, the expert at re-organizing failed companies. But in fact he is merely another magician of money. He built his career by using the methods he learned at the Harvard Business School to conjure something from nothing—or less than nothing, as he loaded previously solvent companies with debt and stripped them of their assets (including, of course, their labor force). He may use the rhetoric of productivity to reconcile his faith with his economic practice, but the rest of us have reason to fear that we are back in Joseph Smith’s world of confidence men—of smiling scoundrels, earnest frauds, and Nauvoo bogus. Jackson Lears, Board of Governors professor of history at Rutgers, is editor of Raritan and is the author, most recently, of Rebirth of a Nation: The Making of Modern America, 1877–1920 (HarperCollins). This article appeared in the November 8, 2012 issue of the magazine.